The study of how literature affects and is affected by the environment is one of UCSB’s most innovative and vibrant academic programs. This branch of literary criticism focuses on the ways in which texts of all types shape and respond to conversations about animal welfare, global warming, humanity’s role in the world and our potential revolutionary futures. 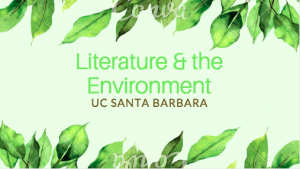 UC Santa Barbara’s English Department allows undergraduates to explore the intersection of literature and the environment from a multiplicity of angles and at any levels. Students interested in the subject are welcome to take one or more of the many courses offered or attend our varied English Department sponsored events. If you decide you want to get more involved with the community, you can declare a Specialization or even earn Honors through our program! Get a “green” B.A. in English! Those invested in the environment, the future of our planet, or curious about exploring the literary history of the natural world might be interested in the Undergraduate Specialization in Literature and the Environment (L&E). In addition to receiving the regular UCSB diploma at graduation, students completing the Literature and the Environment Specialization will be awarded a special certificate at the English Department’s Undergraduate Commencement Reception. 1) Majors who have completed at least two quarters of the junior year with a minimum GPA of 3.5 (overall and/or in the major) may apply for admission to the English Department’s Honors Program. Students who satisfy the requirements of the Honors Program by completing English 199 and 196 with an acceptable environmentally-themed thesis will receive Honors in the Literature and the Environment Specialization. L&E Specialization Honors Certificates will be awarded at the English Department’s Undergraduate Commencement Reception. This is a great way to engage deeply in a growing discipline, and a smart investment if you’re interested in pursuing graduate school or a job in the area.